(* Junior Resident, ** Assistant Professor, *** Associate Professor. Department of Obstetrics and Gynecology, Seth G S Medical College and K E M Hospital, Mumbai, India). Pyometra is a rare condition generally seen in postmenopausal women. Pyometra rarely leads to spontaneous perforation. Here we are presenting a case of a 61 year old postmenopausal woman who had got an intrauterine contraceptive device (IUCD) inserted and had then totally forgotten about its existence. She developed a pyometra that subsequently lead to uterine perforation which resulted in her presenting to us as a case of peritonitis. Imaging was suggestive of uterine perforation. It was managed by exploratory laparotomy with subtotal abdominal hysterectomy and intraoperative vaginal removal of the IUCD. Pyometra is defined as the build up of purulent fluid in the uterine cavity secondary to infective or degenerative processes. Spontaneous perforation is a very rare complication of pyometra, but it must be considered in the differential diagnosis of peritonitis in elderly women. Its incidence among gynecological condition is 0.03-0.11 %. Incidence increases to 0.2 % in postmenopausal elderly women. Various etiological factors of pyometra are uterine or cervical benign and malignant tumors like endometrial polyp, leiomyoma, cervical and endometrial carcinoma, radiation cervicitis, senile cervicitis, forgotten intrauterine contraceptive device and cervical occlusion after surgery. [2,3,4,5] Forgotten IUCD is an important predisposing factor for pyometra in postmenopausal patients. In a study done by W.C. Lien, 28.6% of pyometra cases were associated with forgotten IUCD. A 61 year old postmenopausal woman, married since 40 years para 4, living children 3 came with complaints of severe pain in abdomen since 6 days. She also had distension of lower abdomen since 5-6 days with fever on and off. She also gave history of constipation since 4 to 5 days. She gave history of IUCD insertion 25 years ago which she forgot to remove. She attained menopausal about 20 years ago. On examination she was thin built, vitally stable. On examination, abdomen was distended especially the lower abdomen. Tenderness and guarding were elicited. On per vaginal examination, IUCD thread was felt and there was tenderness in all fornices. Sonography was suggestive of peritonitis. CT scan showed an endometrial abscess with rupture of the anterior wall of the uterus of approximate size of 0.5-1 cm. An IUCD in situ with pneumoperitonium, gross ascites and pelvic collection were also detected. All blood investigations were within normal limits. An emergency exploratory laparotomy under spinal and epidural anesthesia was done. 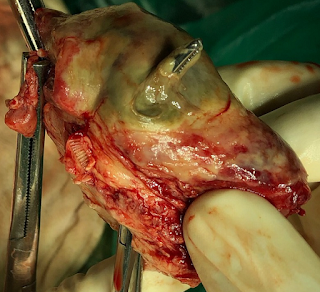 Intraoperative 1-1.5 liter seropurulent fluid was drained. It was sent for culture sensitivity which subsequently showed the growth of E.coli bacilli. There was a thickened omentum covering the bowel loops. Bowel loops were adherent to each other and edematous. Uterine fundus was necrotic and a perforation of approximate 0.5 to 1 cm was present in the anterior uterine wall. (Figure 1) A greenish colored foul smelling discharge suggestive of pyometra was seen coming out from the uterine perforation. (Figure 2) IUCD was removed vaginally by pulling out the threads and then a subtotal abdominal hysterectomy was performed. 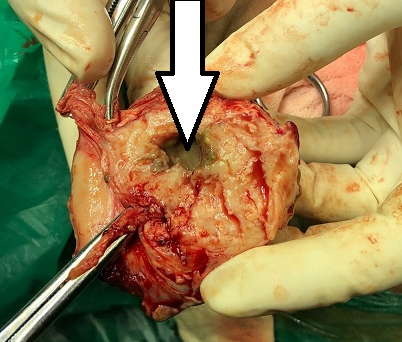 As the entire pelvis and abdomen was contaminated with purulent fluid and the bladder was densely adherent to the cervix a subtotal hysterectomy was done. 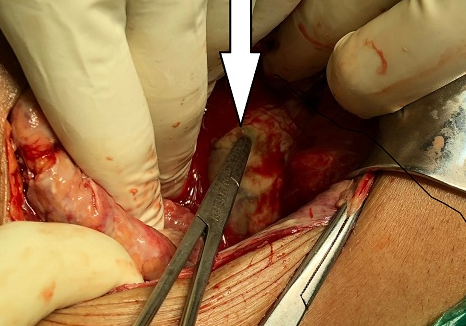 However, care was taken to see that the entire necrotic part of the uterus was excised and the incision went through the healthy tissue only. Figure 1.White arrow shows rupture below the uterine fundus. Figure 2. White arrow shows uterine cavity filled with purulent discharge. Figure 3. Specimen after sub total hysterectomy. Hemostat is passed through rent in the anterior wall of the uterus . Intraabdominal drain was kept. Post operative parenteral antibiotics injection piperacillin/tazobactum were given as per culture sensitivity report. Postoperative patient was stable. She had no fever spikes and she tolerated oral intake well. On post operative day 7 wound check was done. It showed an adherent burst abdomen. Wound culture grew E.coli organism that was again sensitive to piperaciline/tazobactum and this antibiotic was given for total of 2 weeks. Daily compression dressing was done. Repeat wound swab was sent for culture and sensitivity after completion of antibiotic course. It was suggestive of no growth. Secondary suturing was done on day 20 of surgery. She recovered and was discharged after suture removal. Histopathology report was suggestive of acute inflammatory pathology. Pyometra is commonly seen in postmenopausal women. Forgotten IUCD is important predisposing factor for pyometra in postmenopausal patients with incidence of 28.6%. Patients may present with abdominal pain, purulent vaginal discharge, and postmenopausal bleeding. More than 50% cases are asymptomatic. Forgotten IUCD can lead to severe infection. This may present as pyometra, endometritis, pelvic inflammatory disease or tubo-ovarian abscess. Degenerative or necrotic processes in uterine wall and stenosis in cervical canal lead to spontaneous perforation if there is any IUCD. This results in diffuse peritonitis. After rupture symptoms of acute abdomen are seen. However, other causes of acute surgical abdomen should be ruled out. Diagnosis of pyometra is made by ultrasonography and CT scan. It will reveal an IUCD in the uterine cavity in case of a forgotten IUCD. Best management for ruptured pyometra is exploratory laparotomy, irrigation of the peritoneal cavity followed by hysterectomy. In case of unruptured pyometra, cervical dilatation and drainage should be done. In case of a young patient who wants to preserve fertility irrigation of the abdominal cavity and evacuation of the uterine cavity followed by repair of the uterine perforation should be considered. Etiological organisms isolated from the cultures are usually Escherichia coli, Bacteriodes fragile, peptococcus and streptococcus species. About 8–17% of the cultures are sterile. Spontaneous perforation of pyometra is a rare condition and difficult to diagnose preoperatively therefore possibility of perforated pyometra should be considered as one of the differential diagnosis in elderly women who present with acute abdomen. One of causes of pyometra in postmenopausal women is forgotten IUCD. Removal of IUCD and exploratory laparotomy with hysterectomy is best choice of treatment. We would like to thank our junior resident Dr Shalila Chandorkar for the intraoperative images of the case. Muram D, Drouin P, Thompson FE, Oxorn H. Pyometra. Can Med Assoc J,1981;125(6):589-592. Li CH, Chang WC. Spontaneous perforated pyometra with an intrauterine device in menopause: a case report. Japanese Journal of Infectious Diseases. 2008;61(6):477–478. Vyas S, Kumar A, Prakash M, Kapoor R, Kumar P, Khandelwal N. Spontaneous perforation of pyometra in a cervical cancer patient: a case report and literature review. Cancer Imaging. 2009;9:12–14. Lee SL, Huang LW, Seow KM, Hwang JL. Spontaneous perforation of a pyometra in a postmenopausal woman with untreated cervical cancer and "forgotten" intrauterine device. Taiwanese Journal of Obstetrics and Gynecology. 2007;46(4):439-441. Chen P.-H., Hsien-Liu, Lee S.-L., Chang C.-Y., Chang C.-C. Pneumoperitoneum caused by perforation of pyometra associated with a lost intrauterine device and perforated malignancy of the sigmoid colon. Taiwanese Journal of Obstetrics & Gynecology. 2011;50(1):124–125. Lien WC, Ong AW, Sun JT, Tsai MT, Lai TI, Liu YP,et al. Pyometra: a potentially lethal differential diagnosis in older women. Am J Emerg Med. 2010;28(1):103-57.C.J. Chuang C-J, Hung Y-C, Hsieh M-C, Hsu C-S. Huge asymptomatic pyometra with an intrauterine device. Taiwanese Journal of Obstetrics and Gynecology. 2013;52(3):426-427. Nuamah N. M., Hamaloglu E., Konan A. Spontaneous uterine perforation due to pyometra presenting as acute abdomen. International Journal of Gynecology and Obstetrics. 2006;92(2):145–146. Zeferino TM, Banuelos FJ. [Secondary peritonitis due to rupture of pyometra in cervical cancer]. Ginecol Obstet Mex. 2005;73(11):618–21. Tsanadis G, Kalantaridou SN, Kaponis A, Paraskevaidis E, Zikopoulos K, Gesouli E, et al. Bacteriological cultures of removed intrauterine devices and pelvic inflammatory disease. Contraception. 2002;65(5):339-42.